Aren’t these cookies too pretty to eat?! Such beautiful and delicate decoration! The die is from Memory Box, and is called Quinn Flourish. I used it to on a piece of 4″ x 5.5″ card stock, and left it in place, only taking out the negative parts. 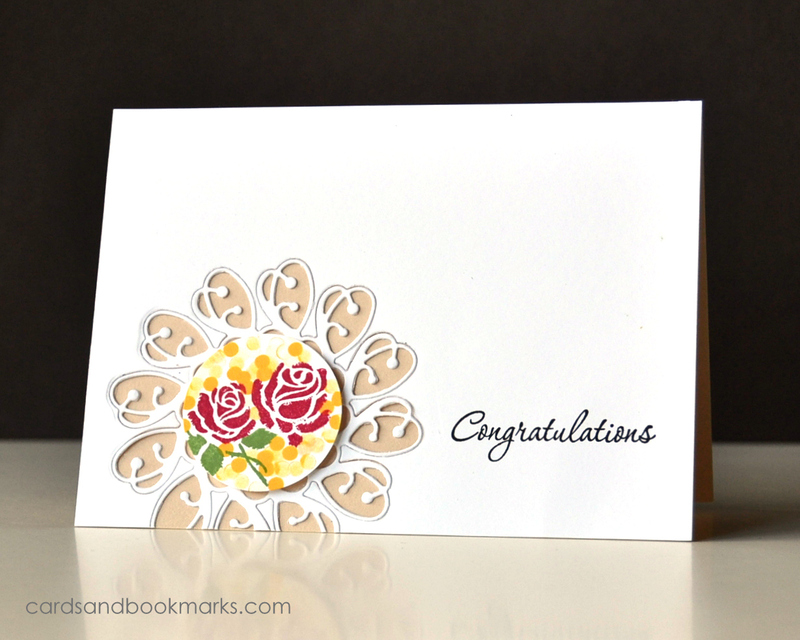 I stamped Roses (retired set from Close to my Heart) and a bokeh background on 1″ diam circle and popped it over the flourish. Finally I adhered the piece on to a cram card base. The greeting is from the SU! set called Love & Laughter. Stop by the CASE Study blog to see what some of the design team members came up with, and I hope you can play along with us! Beautiful card! Great adaptation of the photo (and I didn’t know they were cookies until I started reading your post…lol). Great job! Oh my gosh, brilliant interpretation of those amazing cookies, Tasnim! I can’t imagine anyone want ing to eat one of those beauties, though! When I saw this image I just knew you would make something amazing and you totally did! This is GORGEOUS! Stunningly perfect take Tasnim!! The delicate negative die cut is such a wonderful lace without looking too ‘heavy’ and your stamping is divine!! Your card is every bit delicious as the cookies! Wow….what intricate design and attention to details!